It tells a legend of the only female prime minister of China, Lu Zhen from North Qi Dynasty. Lu was born in a business family, who was intelligent and kind-hearted. Her mother died early when she was a child, as she grew up, she became her father's right hand in business. Her step-mother, an evil woman, was jealous about her being trusted by her father, so she poisoned Lu's father and set Lu up. In order to escape from being hunted, Lu managed to be a maid in the royal palace and worked hard with appreciation. Because of her intelligent, she turned into Emperor Xiaozhao, Gao Yan's pretty bosom friend and got promoted to be a high-rank official. Meanwhile, her persistence and kindness attracted the Crown Prince, Gao Zhan, but their relationship did not develop well because of their different standing. Lu was in the center of the jealousy of another maid, the hatred of Zhan's first lover, the conspiracy of Empress Dowager Lou who killed Zhan's mother. Replying on her wisdom and bravery, Lu was succeeded in helping Zhan to thwart plots launched by Lou's family on purpose of seizing the throne. Zhan was crowned the Emperor, but he couldn't marry Lu eventually. 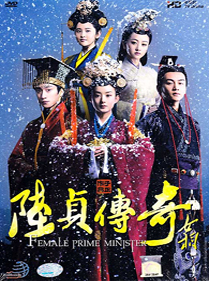 Lu afterwards determined to dedicate herself to assist the next emperor, Gao Wei, and she was finally to be the only Female Prime Minister in China history.